If you think you or your child had an allergic reaction, it is important to see a doctor. Your doctor can refer you to an allergist who can confirm an allergy. Diagnosing a food allergy can be challenging as there is no one test that can confirm or rule out this medical condition. If you suspect that you or your child has an allergy, it is important to see a doctor. Your doctor can refer you to an allergist, a physician specializing in the diagnosis and treatment of allergies. How are you diagnosed with a food allergy? What happened when the reaction occurred (symptoms)? When did the reaction first start? Do any other family members have allergies? This is the most common test used by allergists. Typically, a small drop of the allergen is placed on a person’s arm or back. The skin is then pricked with a special needle, so the body can absorb the allergen. The allergist also places a drop expected to cause a swelling (histamine) to show the test worked, and saline to show that the prick does not cause an itchy red bump. These are called positive and negative controls. After about 15-20 minutes the skin is examined to see if there is any redness or swelling (a wheal). 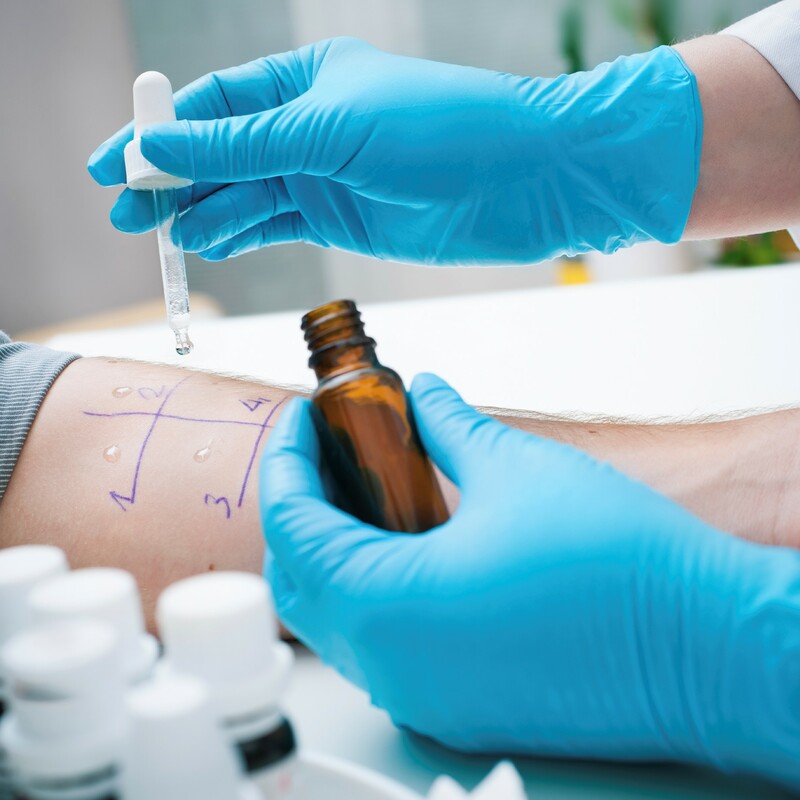 The result of the allergen will be measured and recorded and compared to the control tests; and then the allergist will determine if it is a positive reaction. A positive reaction is more common in people with allergies, however some people with positive tests are not allergic. A negative test is helpful to rule out an allergy, but it doesn’t necessarily mean there is no allergy. Skin tests are a tool that allergists use along with other information to come to a diagnosis. When a person is allergic to something (which is called an allergen), their immune system reacts by making antibodies called IgE (immunoglobulin E) specific to that allergen. A blood sample is taken and then mixed with that allergen. Blood tests measure the level of IgE in the blood. The amount of IgE can help the allergist determine the likelihood that a person is allergic. Finding IgE to a food does not always mean someone is allergic. Less commonly, a person can be allergic without IgE in the blood. The IgE test is a tool used along with other information to come to a diagnosis. Sometimes, even after the patient history questions and testing, it still may be unclear if someone has a food allergy or if they have outgrown their allergy. To help confirm the diagnosis, a medically-supervised feeding, called an oral food challenge (OFC), may be offered. In an OFC, an allergist gives a person increasing amounts of the food they may be allergic to, in timed intervals. During this process, there is a risk of an allergic reaction, which can be severe. If the food is tolerated without any allergic reaction occurring, then the allergist will determine whether the allergy can be “de-labeled” and the person can eat the food. If a person has an allergic reaction during the OFC, the reaction is managed in a medical setting, the allergy is confirmed, and the correct advice for management is provided. This test should only be done in a medical setting under the supervision of an allergist. Avoid your allergen to help prevent future reactions. Find out how to read food labels, avoid cross-contamination, and other tips in our “Living with allergies” section. Carry an epinephrine auto-injector (e.g., EpiPen®) at all times. It’s recommended that if you do not have your auto-injector with you, that you do not eat. Wear medical identification such as a MedicAlert® bracelet. Have a written Anaphylaxis Emergency Plan that describes the signs and symptoms of anaphylaxis and instructions on when and how to use the auto-injector. Share the plan with schools, employers, family, and any others who may need to use it. Learn more about living with this new reality in our newly diagnosed section, including the emotional impact for children.